I just wanted to buy some souvenirs on my last day in Iran and therefore I headed to the Tehran Grand bazaar. I was planning to go there for maybe an hour, but ended up spending the whole day in the Tehran grand bazaar of Tehran. What was I thinking to just go for an hour? Tehran grand bazaar is about twenty square kilometers, has over 200,000 vendors and almost 2 million visitors per day. Some claim it is the largest bazaar in the world. 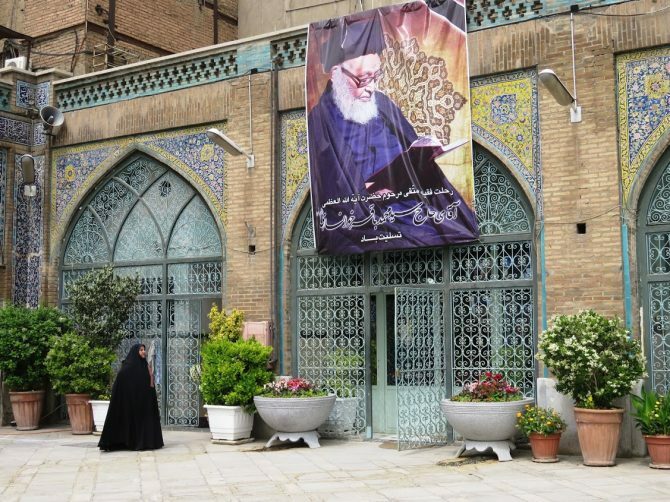 Tehran grand bazaar is a city of its own with hidden mosques, mausoleums and shrines. When you walk through Tehran grand bazaar don’t forget to look up sometimes. The ceilings are beautiful. It’s hard to describe this endless maze of twisting alleyways. Therefore I selected my most beautiful pictures of Tehran grand bazaar below. Tehran’s grand bazaar is in the southern part of Tehran. There are several entrances, with the main one at Sabze meydan. It is easy to get to the Tehran grand bazaar by metro. You should take the red line and exit at either panzdah-e-kordad station or khayyam station. It is located near the famous Golestan palace. Moslem restaurant has almost 5000 visitors every day and serves the best tahcin with chicken in Tehran. It’s a buttery chicken with rice, saffron and barberries. They serve huge portions and the food is absolutely delicious. The long line outside might stop you. I almost gave up, but I am happy I did not. The line goes fast, food is served quickly and is absolutely worth it. You can also read my Persian food guide: eat your way through Iran. Other recommended restaurants in the Tehran grand bazaar that I had no time to try out are Khayyam traditional restaurant, Sharaf Ol Eslami restaurant, Javan restaurant & Shamsiri. Wow this is beautiful, so many colours! Would love to check the food as well. Oh my goodness, that looks amazing! I would love to visit Iran but am concerned about the impact on other travels… 😡 This bazaar looks incredible. Was there much hassle or is it just a nice place to wander around? The hassle was not that bad and mostly I could just wander around. So far I also have no problems entering othetr countries except for the USA. I was in Iran for a month, but honestly spent not much time in Tehran. I did wish I had more time there. I heard from many travellers they did not like TEhran, but from what I saw I tought it was a pleasant city with many parks. Wow! These pics are jaw dropping. And the food! I’ve been dying to go to Iran. I think as US citizen I can’t at the moment. Grrr. Maybe I write to the embassy and beg??? The bazaar looks so colourful and those tiles, wow! the food is absolutely delicious and you will have a great time in Iran.